Houston Durgabari Society Auditorium. It was an exclusive Odissi Dance & Music Festival. Odissi is one of the oldest dances originating from temples of the eastern part of the India, modern Odisha state. Odissi is one of the fastest growing and most popular forms of Indian Classical dance in today’s time. 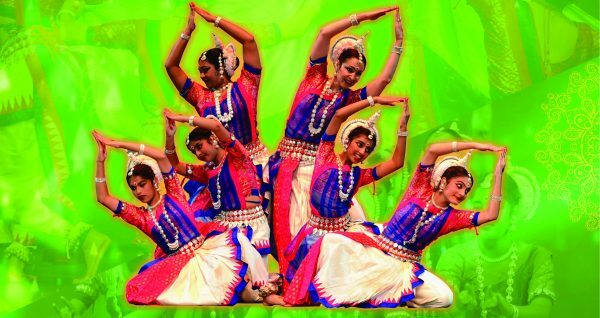 Odissi Academy of Houston, a Texas not-for-profit organization, promotes Odissi teaching & performing in North America. The uniqueness of this academy, it invites talented, practicing, and experienced Odissi gurus (teachers) from Bhubaneswar, India (the epicenter of Odissi Performing Arts), and uses their expertise in coaching local young artists. The crisp spring morning started with bansuri (bamboo flute) recital by Guru Parshuram Das, supported by Shri Govind Shetty. A befitting introduction to the academy starting Bansuri/Flute lessons in Houston. Guru Das is the first bansuri teacher of the academy. Odissi Program started with traditional Mangalacharan – Ganesh Vandana. It’s a dance item salutation to mother earth, the Lord Ganesha, audience, and teacher. Series of performances, such as Pushpanjalee (an ode to Lord Shiva), Mohana Pallavi (pure dance), Nava Durga (an Abhinaya – dance drama), and Konark Shree (a dance describing the use of musical instruments in temples of India) were performed by students of Academy. Students of Odissi Dance Company performed group dances, Nagendra & Mokhya. The star attraction of the day was the duet called “Khamaj Pallavi” by Odissi Academy concluded the event superbly. Two hours of non-stop, the awe-inspiring show was enjoyed by more than 350 guests. The entire program was directed and coordinated by academy’s Guru Mr. Prashanta Kumar Behera. Savory Odia and Bengali cuisine served for lunch.